Hamster wheels are common in the cages of small rodents, but many owners don't realize the risks involved. While the wheel does provide exercise for your pocket pet, it can also lead to tragedy, especially if the wheel wasn't designed for your type of pet. Learn the dangers of hamster wheels before installing this accessory in your pet's cage. Wire-style wheels are one of the worst options you can provide for your hamster. A hamster's legs can fit through the openings and should the animal slip, his leg could get caught between the wires and fracture. However, there are wheels designed to be solid that help prevent fractures. These smooth-surface wheels can also be dangerous though. The hamster may get tossed from the wheel when running at high speeds and break several bones in his body. The safest design has a curved edge that won't allow the hamster to get flung from the wheel. Dismemberment is another hamster wheel danger. Sometimes the animal's toes can get caught in the wire wheels and get ripped off. Not only will your hamster be in terrible pain, but without proper veterinary care, an infection could set up in the foot. If you must use a wheel, use a safe design. If you own a breed of hamster that enjoys living together, such as Robos, hamster wheels can be extremely dangerous. It's not uncommon for cage mates to run under the wheel while another hamster is running on it. This can lead to broken bones, internal organ damage and even death. If you have more than one hamster, use an exercise alternative that will be safe for all members in the habitat, such as allowing the hamsters to play outside of the cage each day. Provide a safe area for them to run around and explore without being able to escape. 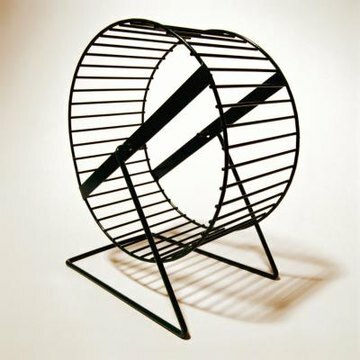 Hamster wheels weren't designed for all pocket pets, yet owners of rats and other rodents with long tails add a hamster wheel thinking that their pet needs the exercise. Hamster wheels don't take tails and long bodies into account. A rat running on a hamster wheel may crush his own tail as it dangles outside the wheel. Understand the exercise needs of your pet so that you can provide safe exercise options.